Wisconsin State Fair...all in the name of research. Before you go any further, be prepared because this is a long one. And all about food. I usually don't like to go to State Fair with people who are interested in the farm animals. In fact, I actually feel most at peace as far away from the farm animals as possible. It's not my scene. I go with the people who like to eat. With that said, two of my friends from school came alllll the way to Milwaukee to visit and eat assorted deep fried things on a stick with me. 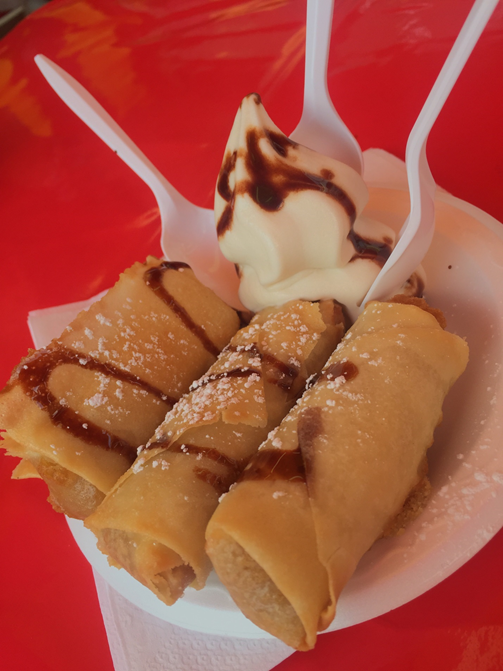 We had been anticipating this outing for at least a month, and we went as far as making a color-coded Google doc with all the things that we wanted to try, where they were located at State Fair, and in what order we wanted to try them. Some say obnoxious, I say genius. We don't waste time. 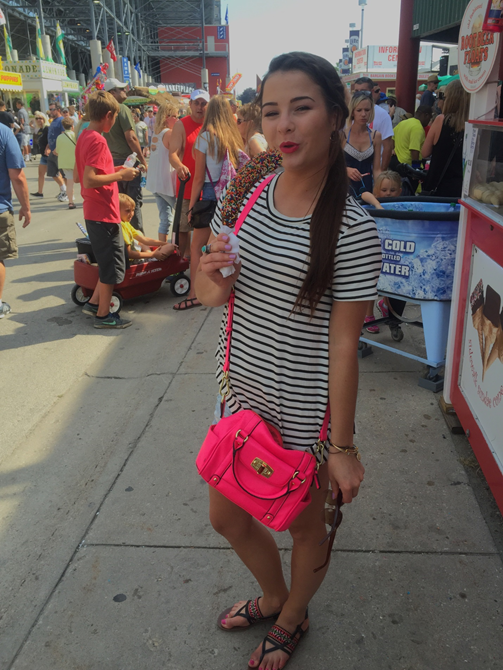 Can I also make a note that Kailey had never been to State Fair before? She thought that she had, but she actually had only attended Valley Fair. And while I'm not confident I know what that is, I know it is certainly not where we were going. First place we went was to the info desk for a map. We made X's in every spot that we wanted to go. It wasn't an easy task, but everything on the map was charted out like Battleship. Loaded Twister Dog, you ask? D9, duh. After standing in the Expo Center for like half an hour mapping out our travels, we were ready to begin. We walked out those doors into a sweaty mess of people walking in every direction. Also usually not my scene. But like I said, it was all in the name of research. I had about 10,000 things on my list to try and I was dedicated to trying just about all of them. What I'll provide you with is this: A brief description of whatever we tried (if provided), commentary stating whether or not it lived up to our expectations, and of course, photographic evidence. This is State Fair Day 1 - Lilly, Kailey, & Olivia Style! Actually the first thing we did was...Meet the sea lions. Although I think my exact reaction when my friends asked, "Should we do it?!?!" was a hesitant, "Sure," I'm actually glad we did. 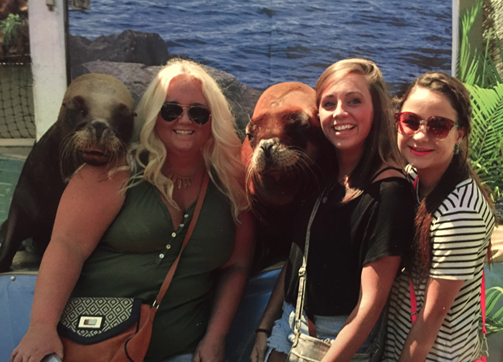 They didn't touch me, and I now have a pic with two really friendly sea lions nuzzling my friends' heads. #1 - For our first snack, I got the Battered Cajun Shark on a Stick from Joey's Seafood & Grill. This included their own Cajun Ranch sauce. This was a first for me! I love seafood but cannot recall the last time I had the opportunity to eat a shark. Well, yesterday was the day. It tasted basically like fish, but had a tougher consistency (that I would say was a cross between fish and chicken). It was lightly battered and super crispy. Although I didn't really taste much of a cajun flavoring, the shark itself was pretty flavorful so I didn't mind. I would recommend. 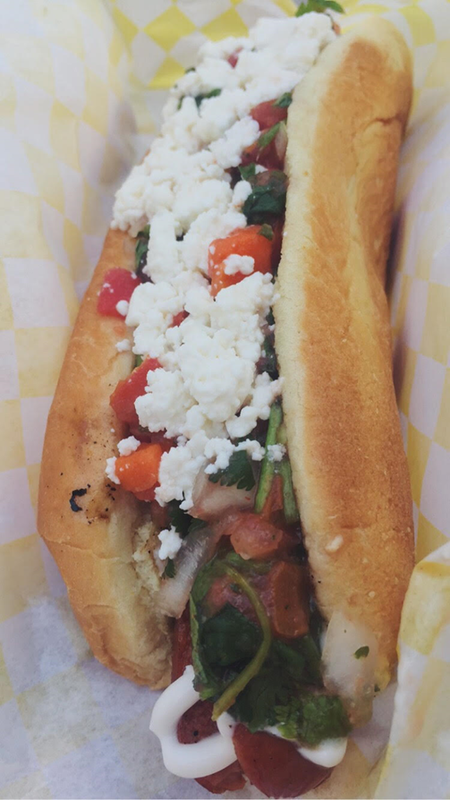 #2 - Loaded Twister Dog from Water Street Brewery. 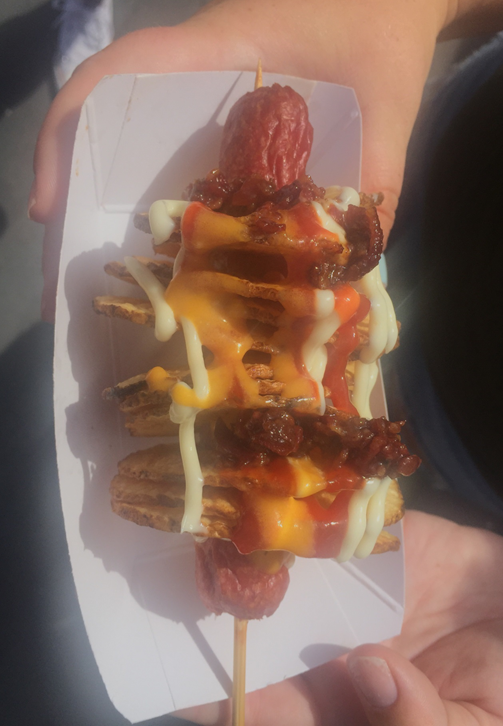 "Spiral cut Potato wrapped around an all Beef Hot dog and deep fried. Topped with Jalapeno Pale Ale Cheese Whiz, Mayo and Sriracha Ketchup. Sprinkled with Water Street Brewery Oktoberfest Beer Candied Bacon Bits and served on a stick." This was Lilly's, but I tried it and well, it gets all over your face. It's a good idea in theory. All those things sound like they would go well together (and they probably did), but it was hard to eat all at once. The candied bacon was really good, though. Another downside was that you couldn't really taste the jalapeno cheese whiz, and that's just not fair. So in essence, all its parts separately were alright. Lilly wouldn't recommend. And I'm just staring at the picture thinking...how did they intend for a person to be able to eat this thing? The stick actually hinders the eating, which defeats the entire purpose in my opinion. #3 - Deep Fried Stuffing from Rupena's. This is pretty much self-explanatory. Deep fried stuffing balls served with gravy. Also should mention that this is my personal favorite and I get it every single year. I cannot explain to you how amazing these stuffing balls are. If you're a regular Thanksgiving stuffing fan, you will be obsessed with these. They come exactly as advertised. They're soft, easy to eat, and I am in love with them. Obvi, I'd recommend. #4 - Lug Nuts On-A-Stick from Knucklehead. Also got a side of bleu cheese dressing. 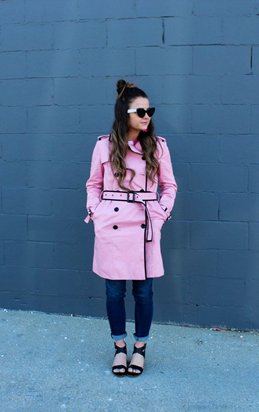 This was another one of my favorites, and it wasn't even on our list! If you like super crispy, deep fried tator tots, jalapeno, and bacon, you really can't ask for much more. 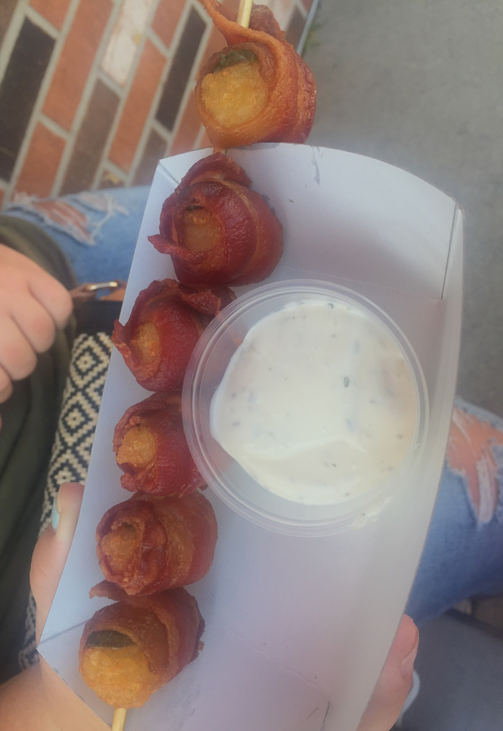 They're really spicy (which I love) and they definitely didn't skimp on the bacon (like other bacon wrapped tator tots I've got from the fair in the past). 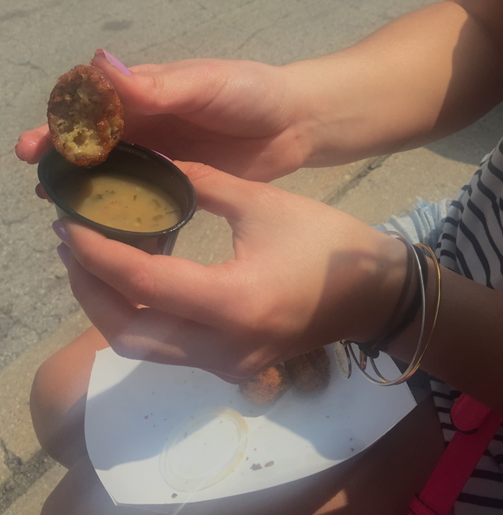 The bleu cheese dipping sauce wasn't necessary, but it added another dimension to the Lug Nuts' flavor. I'd recommend. 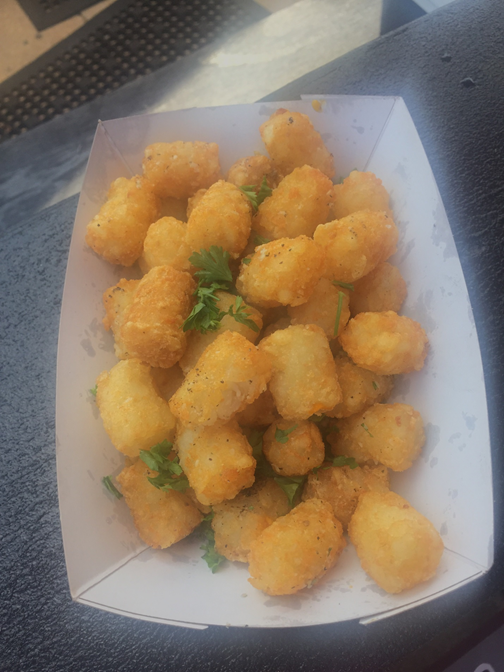 #5 - Also from Knucklehead, Parmesan Truffle Tator Tots with parsley. This was the best way I've ever had tator tots served in my life. Not that I eat them all that often, but they were amazing. Every tot was seasoned to perfection with the perfect mixture of truffle oil, parmesan, and parsley. But I am the person who always says yes to the $1 extra to add truffle oil to ANYTHING, so I may be a little biased. These are either otherworldly or I was just starving. I'd recommend. 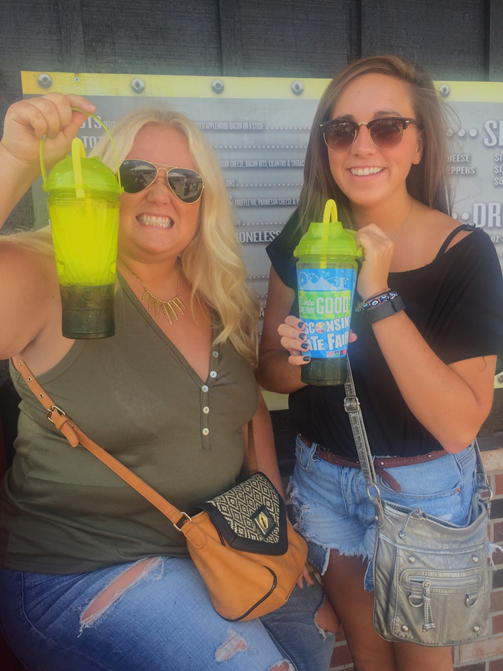 Then my friends got their souvenir State Fair refillable tumblers. How cute. Gross Fun Fact: Some of my photos appear cloudy...this was definitely due to the grease from the food and me accidentally touching my camera lens. That's disgusting and I'm sorry. State Fair is a lot to handle with your hands full! #6 - Fat Elvis Sundae from Lakefront Brewery. "Reese's Peanut Butter Cup dipped in Banana Batter and Deep-Fried. 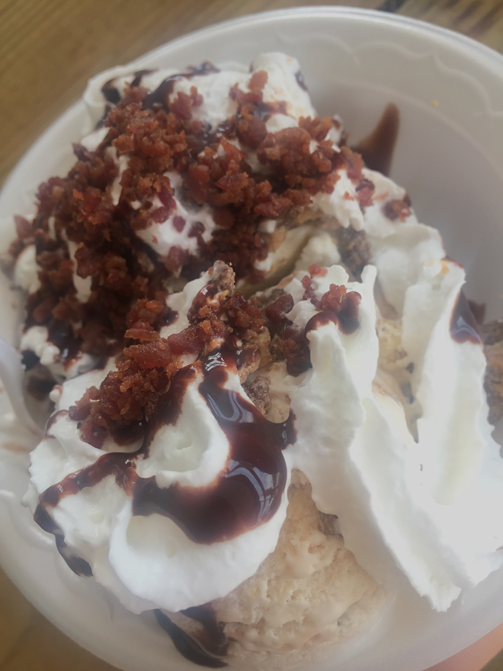 Topped with Peanut Butter Banana Ice Cream, Chocolate Sauce and Whipped Cream and Bacon Sprinkles." My personal thoughts were that the Reese's Cup was perfectly fried, very light and crispy. Neither the banana nor the peanut butter flavors were too overpowering (which I find is common with either of those flavors). The saltiness of the bacon was the perfect combination with that much sweeeeetness. I'm going to tell you a secret and it's that I don't like peanut butter very much AT ALL. In small doses it's okay. But this monstrosity...it almost converted me to the dark side. 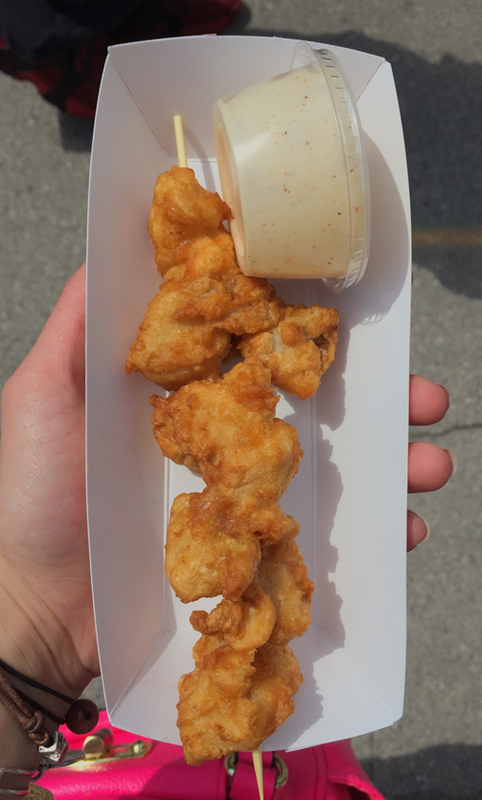 #7 - Beer-Battered Pretzel-Coated Cheese Curds from Tropics at the Fair. "Wisconsin cheese curds coated in a batter made of pilsner beer, crushed pretzels and panko bread crumbs. Deep-fried and served with a zesty Caribbean sauce." 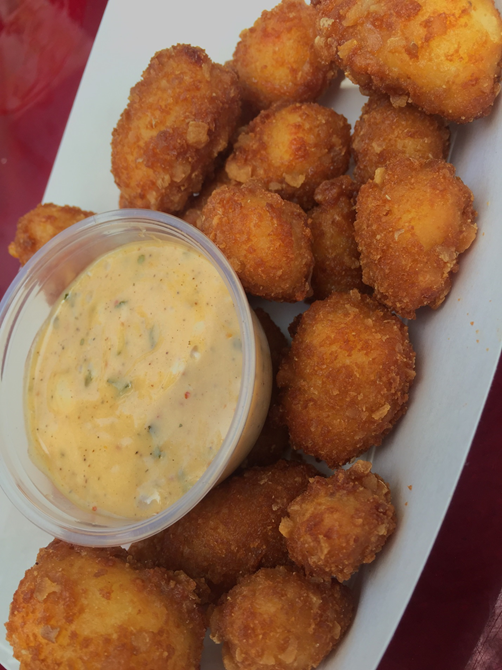 What's the Wisconsin State Fair without cheese curds? Unfortunately, this was the worst of our culinary experiences for the day. The deep fried pretzel made the otherwise good cheese curds seem really dry. The Caribbean sauce was sweet and didn't appeal to any of us. I'm sad about this one. Wouldn't recommend :( Stick to the regular cheese curds from the cheese curd stand, they're literal heaven on Earth. 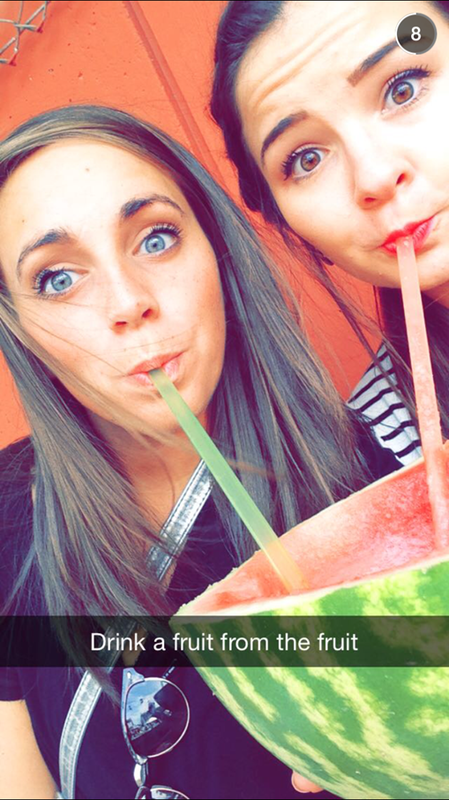 #8 - Watermelon Beverage Served in a Watermelon from Drink a Fruit from a Fruit. This was the coolest thing I've had there. And it was super refreshing! 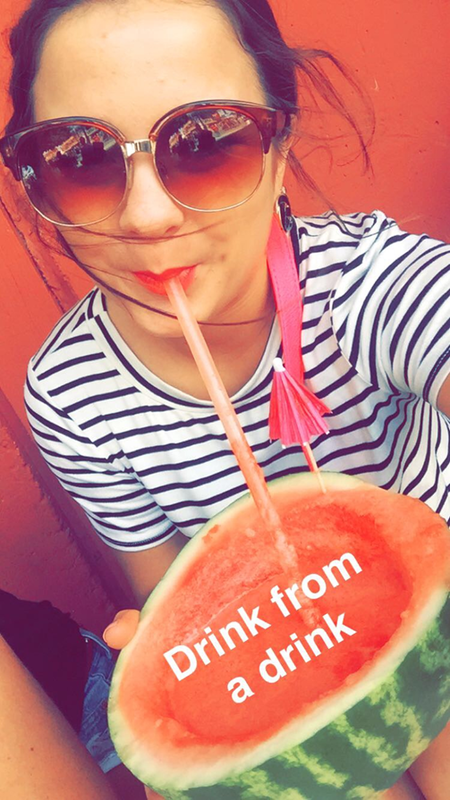 Just watermelon and ice blended and poured back into the watermelon. And limitless selfie options included. 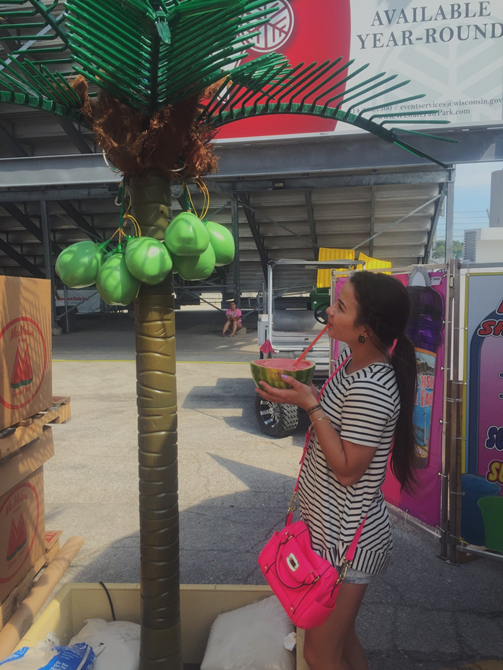 At this point in the fair, I hadn't bought a drink yet because I was waiting on this one. 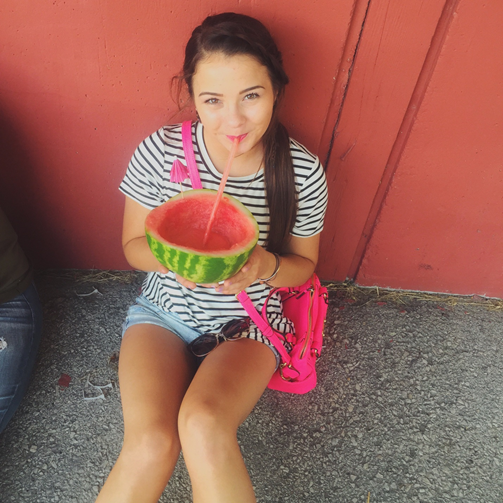 My friends had their sodas and I was basically dragging them through the fair grounds in a frenzy because I was feeling a dehydration headache coming on. That's prob why I appear so content in the top pic. I was being dramatic and annoying, but you know what it's like to be thirsty. I don't know if they made up this concept or if they just work there (I'm guessing the latter), but kudos to whoever's brainchild this actually is. They're expensive-ish too ($10) but I guess you do get a refill for $5. Except by the time you're done, you're super full of half a watermelon and can't eat or drink another bite. I don't know how I messed that one up. Yes, I would recommend this. You can also do pineapple from a pineapple. 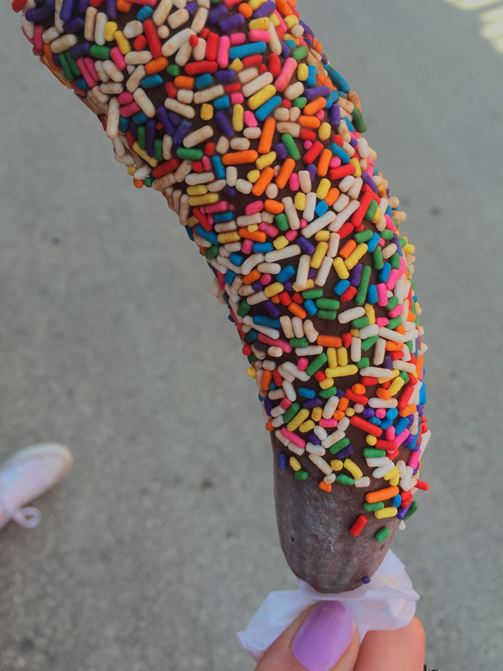 #9 - Chocolate Dipped Frozen Banana On-A-Stick from Sidewalk Sundae. Another one I get every year. Something about a banana smothered in chocolate covered in a rainbow makes my mouth oh-so-happy. Also great for inappropriate photos, if you're into that. The humorless, avert your eyes. It's one of my go-to's, so yep, I'd recommend. 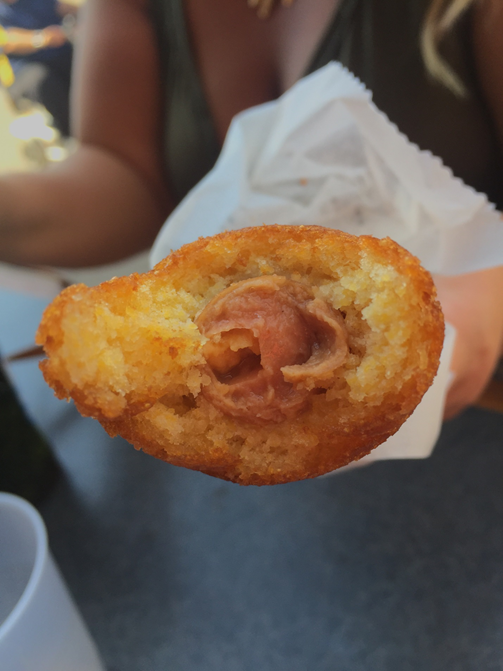 #10 - Jalapeno Cheddar Corn Dog from 3B Corn Dogs. 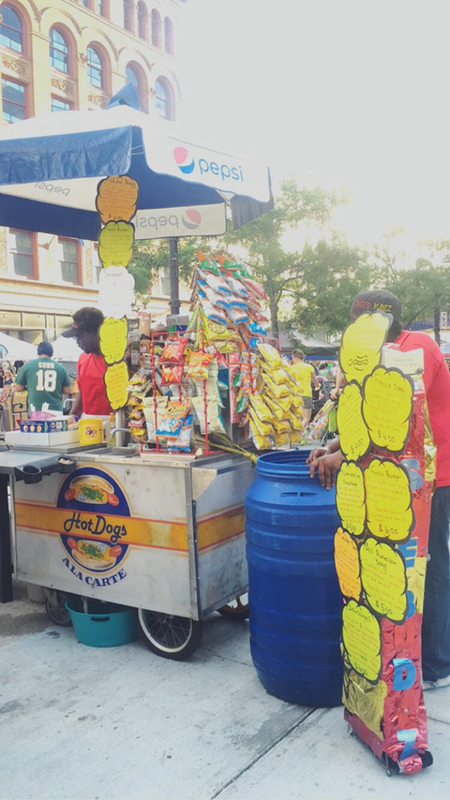 "Hot Dog with Jalapeno and Cheddar inside the Dog and dipped in Corn Dog Batter." 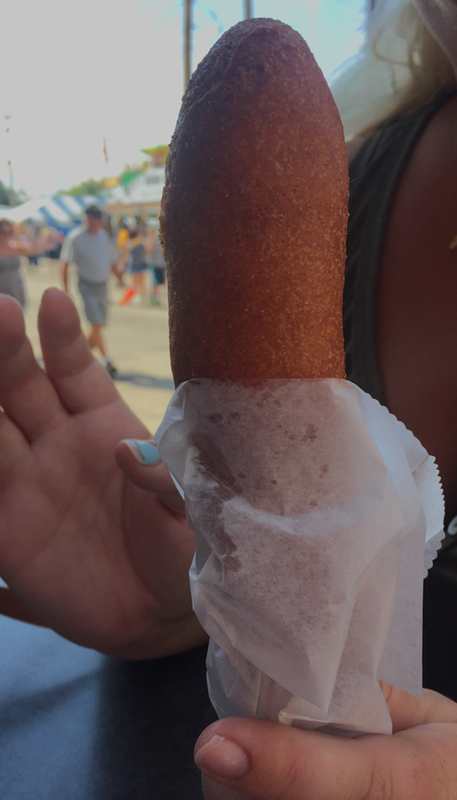 Say hello to this gigantor corndog. I was REALLY full by this point, and I mean REALLY. Lilly ordered this, but I took a bite. Even through my gluttonous overeater's haze, this was still pretty delicious. It had a bite to it, too! 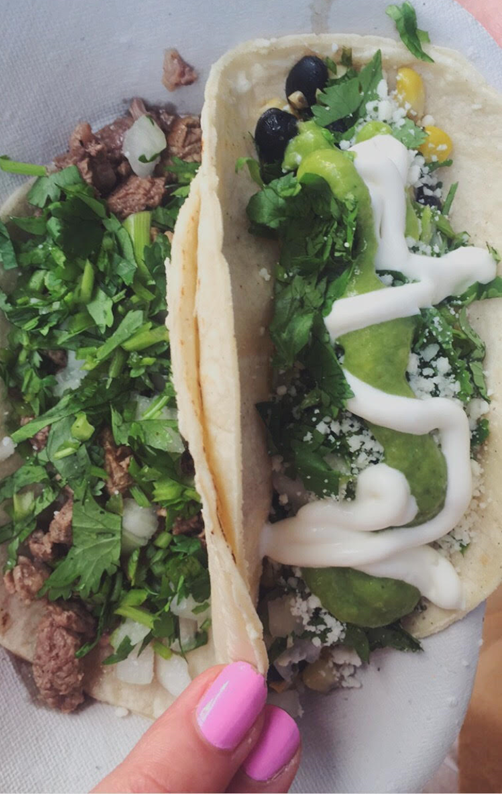 You can't see the jalapeno, but I promise that flavor is in there. I would recommend! That's if you're hungry, because it's huge. 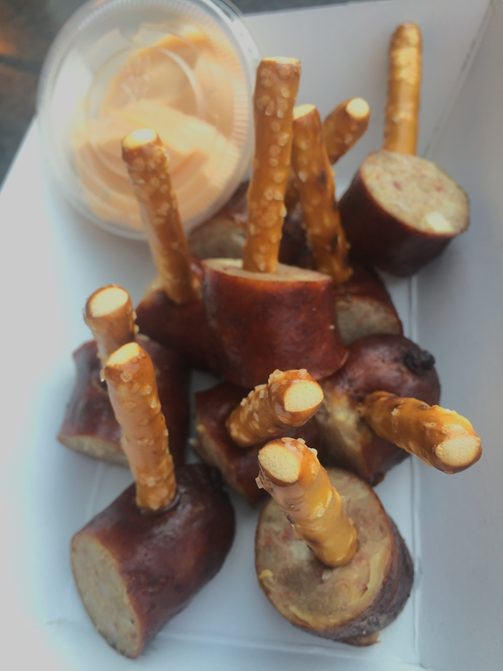 #11 - Reuben Bites On-A-Pretzel-Stick from Slim McGinn's. "Two Reuben Brats (Made with Corned Beef, Swiss & Kraut) grilled and sliced. Served on Pretzel Sticks with Horseradish 1,000 Island Dressing." I couldn't really determine all the Reuben flavors from this sausage, but I was promised they were in there. Otherwise it was just a really great snausage. I don't think the dip is necessary, but I've never been a fan of horseradish or 1,000 Island. I would recommend these! This picture actually makes me kind of sad too because we had to throw like two of these out. We wanted to try them, but were just SO FULL. I carried one of these around with me while we walked around the park because I couldn't eat it right then, but I couldn't bear to part with it either. This was the moment when we decided that next year it would be best if we brought backpacks with Tupperware. We're such novices, ugh. 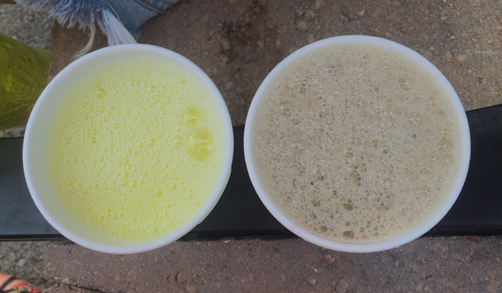 #12 - Banana and Root Beer Milks from that 25 cent barn! 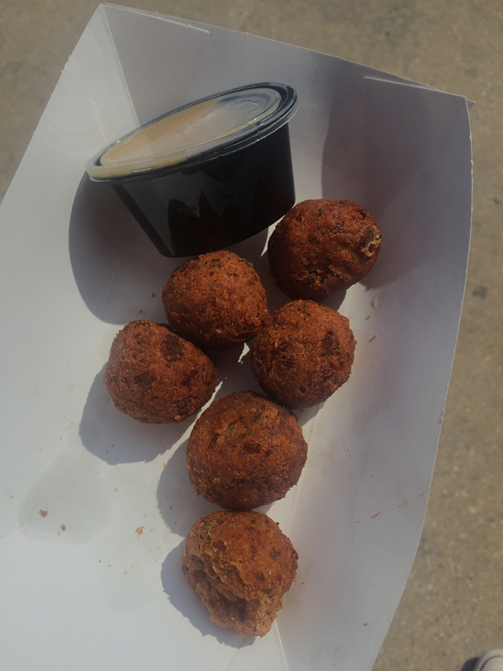 If you pass these up when you go to State Fair, you really should have a serious discussion with yourself about your priorities. I mean, really. I don't even like milk and I get these two flavors every year. This isn't your run-of-the-mill milk. The root beer one is like a root beer float but less filling. The banana is...well I'll be honest it tastes artificial. But I like banana anything. I'd of course, recommend. #13 - Deep Fried Cookie Dough at Emma's Cookie Kitchen. It was painful to eat at this point. Lilly and Kailey ordered this, and I had no intentions of eating it. But then they couldn't finish the third one and then I remembered I needed to write this blog. So you're welcome, I stuffed yet another unhealthy treat in my mouth. I don't regret it. It definitely needs to be dipped in the ice cream. I don't think I could eat the whole one without that to balance it out. This is way better than eating regular raw cookie dough because it's warm, with a crispy outside. Love it. I would recommend. I'm just going to wrap this up real quick because I'm tired and you're bored. I may go back to State Fair, I may not. But I think 13 things in one visit is quite the record I've set for myself. It's almost embarrassing. Whatever. It's not like a regular farmer's market, it's like a cool farmer's market! Without the vegetables, thank God, because vegetables bore me. Actually I think there might be one booth of arugula or something. Anyway, I really wanted to go to this event because it only happens once a month and I'm always curious about new things happening in this city. 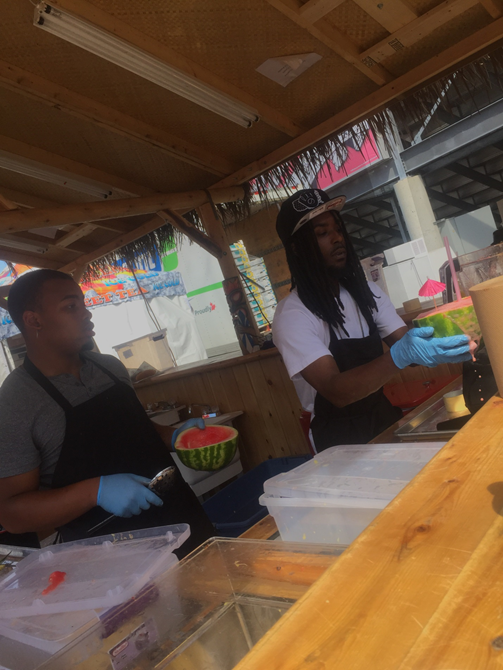 There are local restaurants, food trucks, and art vendors. Some of my favorite things! 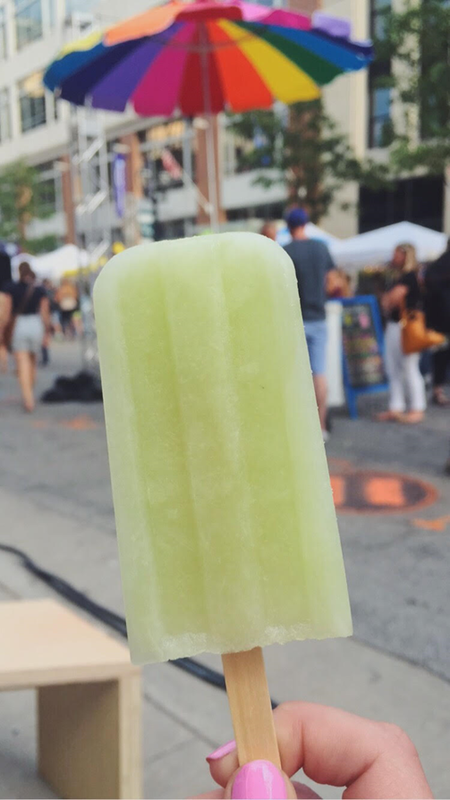 Here's my little explanation of all the things I tried at the July NEWaukee Night Market. So the first place I stopped was at Pete's Pops. I was totally torn about what flavor to choose, but settled on Cucumber Lime because it seemed totally refreshing. And it was. There was also a melon one and an AVOCADO one! And even though I'm not a huge fan of peanut butter & jelly sandwiches, I would have tried the popsicle! I want to try them all. For some reason I'm just so intrigued by these. Such a simple idea and they're so good. Obviously I love decked out hotdogs. I'm not even sure if this little establishment had a name, but we gravitated towards it anyway because of the street meat. This was the Fresco Dog. Pico de gallo, mayo, and queso fresco. We have already recreated these at home. I've eaten like four. Then we did the same thing with burgers which was equally if not more delicious. 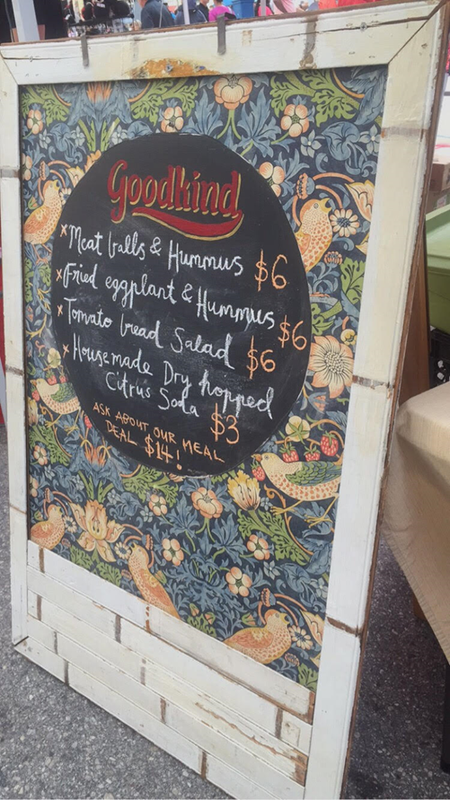 We also got this fried eggplant and hummus from Goodkind (which I'm kind of surprised I've never heard of). It was great. 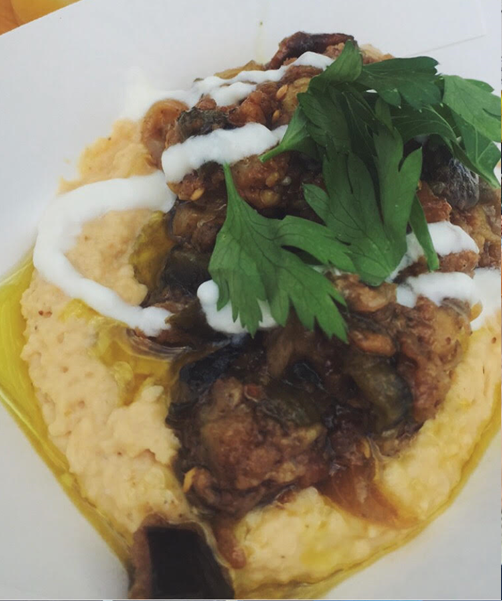 I'm obsessed with eggplant and sometimes hummus. But could have used chips or something! I've never had hummus without anything to scoop it up with. Starting to think I'm not normal if a restaurant serves it this way? Unclear. And like, they have a super pretty sandwich board!! 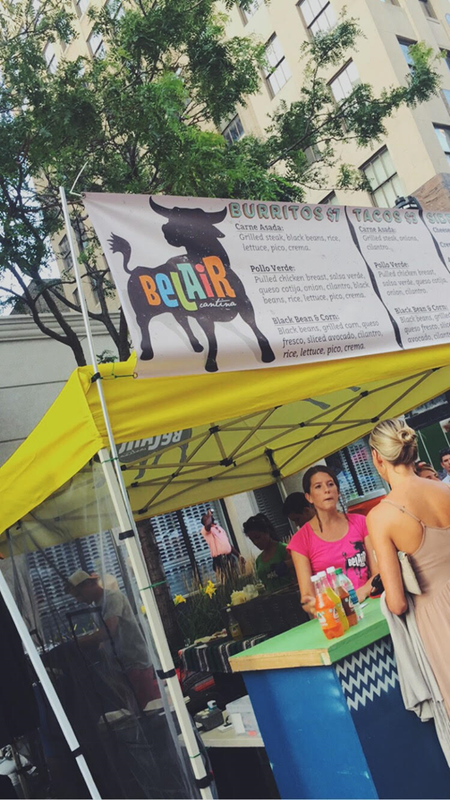 Then I got tacos from Belair, which I've already blogged my love for before. These are the Carne Asada and Black Beans & Corn. Usually I prefer the crazier flavors of tacos they have at the regular restaurant, but I'm sure they have to appeal to all the picky people out there. Basic. These were still obviously good though, you can't really go wrong with Belair, as far as I know. 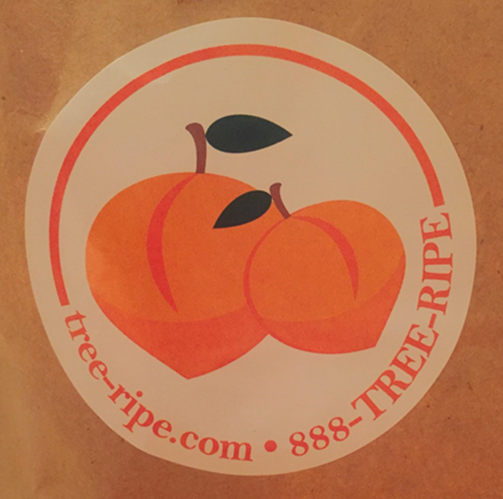 Finally we picked up a 4lb bag of peaches for $9! 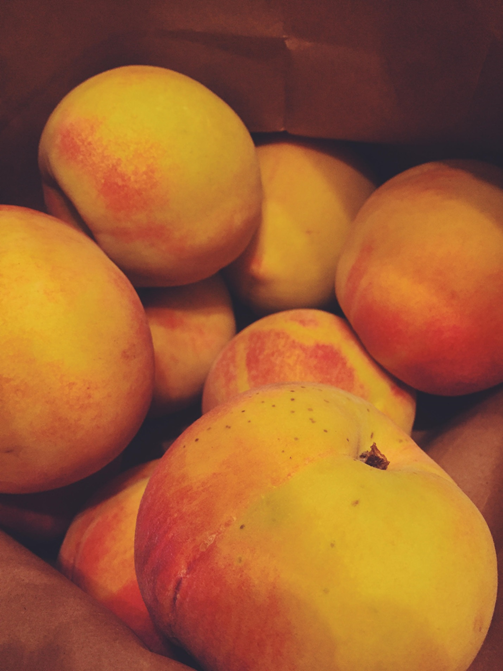 I don't even know if that's a good deal or not, but I also didn't know I liked peaches so much. Can't get past the texture though. They're so good but way too fuzzy. Freaks me out, but it doesn't stop me from eating them. 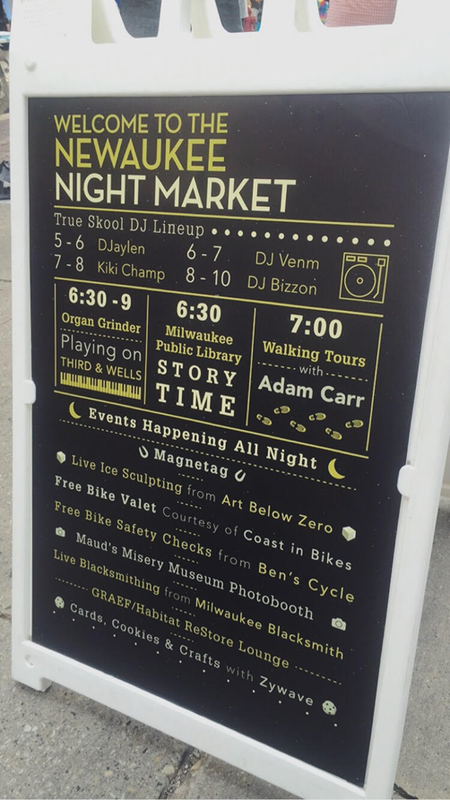 I want to go to next month's NEWaukee Night Market, but buy some of the handmade crafts and prints and stuff. This time I wasn't prepared enough, just ate a lot. I did buy some candles though! It's funny because I had been looking at Big White Yeti's Etsy like a week before I went to this market. They were on a break when I was on there (now they're selling things again) and I was sad I couldn't look through their candles. So happy I found them! A coffee scented candle seemed only natural for me to buy. 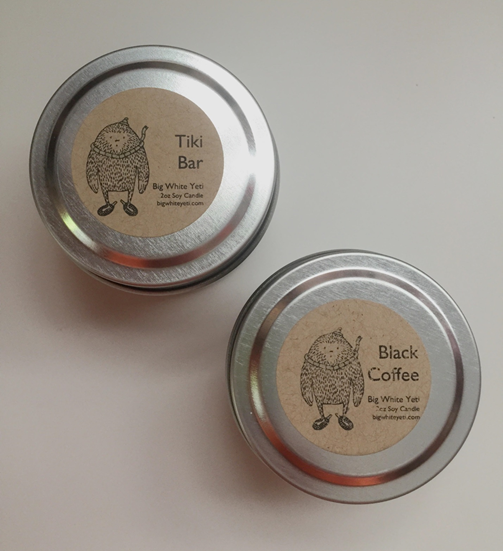 I also went with Tiki Bar because why not. Next time I'll try to get there first because by the time I got to their stand, their bestsellers were sold out. 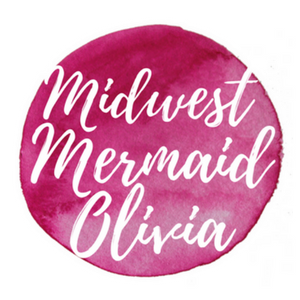 They make these soy candles in their basement in Bay View. I bought the little ones for $5 to make sure they were candles you can actually smell, and they are! I love them. Now even if I'm not drinking coffee I can still smell it...a true addict. Overall it was really cool. Like ice sculptors, live blacksmiths, live music kind of cool.